M de Lange vs Shakib Al Hasan. The East Bengal Tigers, mauled the Indians, Sri lankans and almost the Pakitanis in the recently concluded Asia cup. Shakib Al Hasan should have been playing, but the KKR manament went for M de Lan ge the fast bowler, whose economy rate was more then 9. He gave away 36 runs in 3 overs. 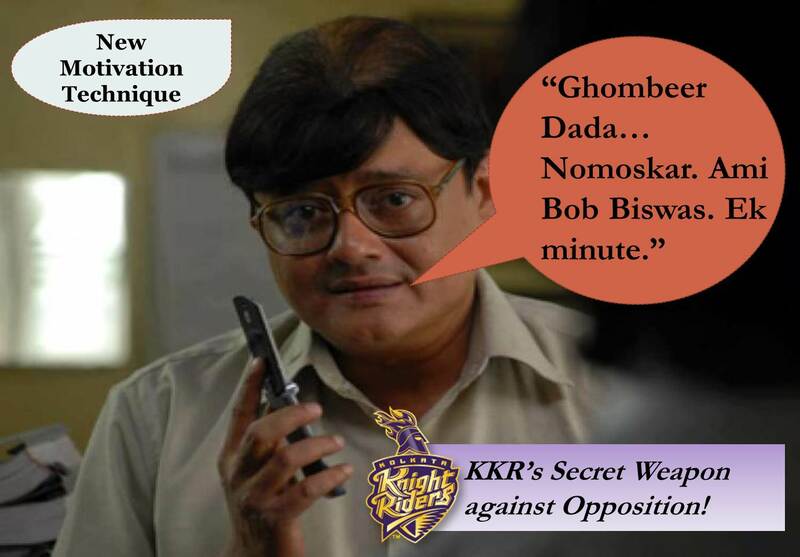 The reason to pick him – well the same reason Buchanan wanted the multiple captains in IPL2, just to remove Dada. This is called the GSKA Syndrome. Shakib Al Hasan also appeals now in SRK style. So please pick him up in the next game. He will do well! The match was poised evenly with KKR hitting those neat sixes. Without those lusty hiting it would have been a no score. Delhi looked organized in the chase and the promotion of Irfan Pathan was a good one. What impressed me was Finch, who kept the ball on the ground and rotated the strike. Early days yet but IPL5 should give us a new champion and good stories. and SRK will say… Picture ABHI BAKI HAI!!! And will use the new secret weapn now. Nomoskor Ek Min! Other Cricket News: Pieterson hit his 20th test century, 151 vs 165 balls. and also got warned for the switch hit. England grinded and fought… all top 4 countributed. Good fight back after the first test loss.